Posted December 19, 2016 by finnfemme & filed under Fashion, Vintage. In 1957, the Earth shoe was developed in Denmark by Anne Kalso. The idea was for a negative heel shoe – a shoe with the heel lower than the toe. The concept was that these shoes would allow you to walk ‘naturally’, like when you walk barefoot in the sand and your heel sinks down lower than your toes. Anne was convinced that this was the natural way to walk, and that this shoe would work in harmony with your entire body. 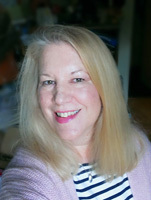 She worked on the design for 10 years, refining details until they were perfected. The sole was also molded in a special way to allow you to walk in a ‘gentle rolling motion’. The toes were wide to keep from being cramped or squashed. 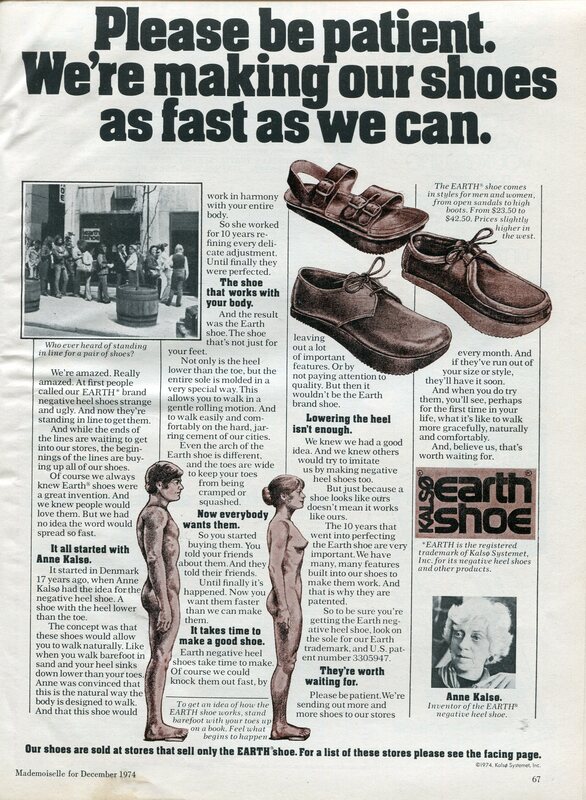 By 1974, apparently everyone wanted Earth shoes. People were standing in line to get them. There was a supposed shortage, and the Earth shoe company was pleading in this 1974 ad to “Please be patient. 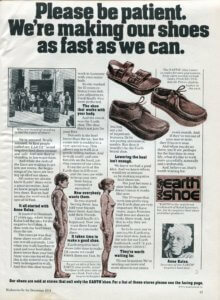 We’re making our shoes as fast as we can.” Earth shoes were sold only at Earth shoe stores. You could also write to the company (via snail mail, of course), and they would send you a brochure that explained how to order the Earth brand shoe by mail. My memory of the Earth shoe is that it was a rather short-lived fad. I thought they were incredibly ugly and clunky looking. My brother Bob was a big fan of them though – he wore them for years. I think guys could pull these shoes off better than women though. What’s funny is that a few years back, I found a pair of Earth sandals in a thrift store. I bought them just to try them out, and to see if they had any merit. Well… no. I found the negative heel disconcerting, and the front part was very heavy. Walking in them was more like plodding and slapping the front part down. It seemed to have a negative pull to the whole body. You definitely don’t feel energetic in these shoes. I donated them back to the thrift store.